1. Get your ideas in early! It’s no secret that trips away take time to plan, but perhaps even more importantly they take time to save up for. Therefore, my best advice is to take a day or evening with your partner, family, friends, dog (whoever!) and have a holiday brainstorm so that you can hash out where is the best place for you. New Years Day is always a great one for this I find, so that you can get yourselves excited for the year ahead, but it can literally be any time you choose. 2. How long can you feasibly go for? This is all dependent on your personal situation but good to think about early. For some people a big trip might mean a week – which I too definitely still class as long stay – but there might be others who, for example, might have accumulated a month to work with. Either way, you need this decided early on so that you can determine whether you can make your dream location worthwhile. For instance, if you only have 10 days and are planning anything with a flight over 10 hours it might be worth thinking about travel times, jet lag and whether you will be able to make the best of it in the time you have. 3. Research flights and living costs. Any airline deals? As soon as you have ironed out the early details (i.e. where you want to go and how long you can go for) it is best to start researching asap. This doesn’t just mean looking at beautiful pictures on the Internet; I’d actually aim your early research at flight and hotel costs to try and get a realistic idea of how much you’re going to need to save. Expedia and Booking.com are great for a competitive idea of hotel rates and my advice is to get yourself signed up for as many alerts as possible with Skyscanner and other airline websites so that they can notify you when flights to your chosen location have significantly dropped in price. After you’ve got your basic facts there is no better way to find out about a place than speaking to people who've been or, even better, live there. It doesn't have to necessarily be someone you know, it can be friends of friends and, I mean, that's what travel bloggers are for, right? Of course, that’s not to say you should base your entire preconception on the opinions of others but chatting to people can help you to find out about any hidden costs that might not be immediately clear (i.e. city tax, tipping culture) or on the flip side any great ways to save money that aren’t that widely known about like recommended car hire companies etc. 5. Is this the right place for you? 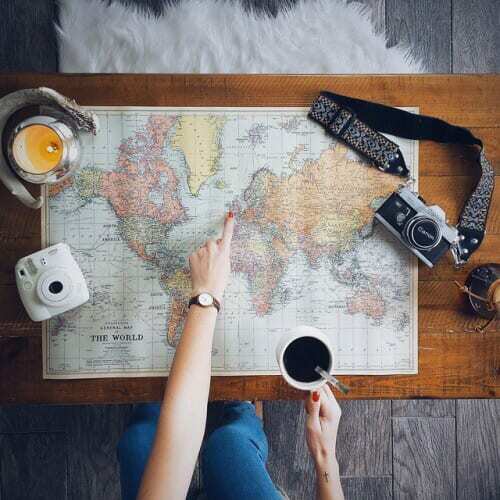 Hopefully by this time you should have gathered a considerable amount of information about your chosen destination, so now its time to weigh up once and for all if this is definitely the place for you. If you can’t see any problems standing in your way then happy days but if you’re having doubts or you just don’t think you’re going to be able to make it work this year then there is no harm in going back to the drawing board. The world isn't going anywhere after all and there will no doubt be another option open to you, which will be all the more clear now that you have siphoned out exactly what you want. 6. Plan a monthly budget. That’s right folks, time for the boring part. Be that as it may, making a monthly budget really works and takes immense pressure off you as opposed to whacking it all on a credit card. So – provided you have enough time in advance – set yourself a realistic financial target to meet each month and be sure to stick to it. You will thank yourself for this later when you have more spending money to work with when your trip comes around. 7. Get a separate bank account for travel savings. I’ve always found this works really well so that you don’t find yourself dipping in to your hard-earned funds (no matter how tempting that might be, let’s say around Christmas or on that spontaneous night out with your friends). There are plenty of free savings accounts available with most banks if you don’t add on all of the benefits (unless you want to of course) and some of them even let you open a new account from your mobile phone. 8. Make pin board or, if you haven’t already, join Pinterest. This is an absolute must for researching and inspiring your future travels and if you aren’t already familiar with it, Pinterest is now going to be your bread and butter. However, I’d definitely go as far as to say that at times it can be an information overload so be sure to make a separate Pinboard for each of your planned visits and then you can gradually fill it with bespoke pictures, attractions and most importantly some of the invaluable advice that other travellers have created to suit your particular budget and timeframe. 9. Buy a reputable guidebook. I’ve heard countless tales of people wanting to go off the beaten track and have their ‘own experience’ of places but I am still a firm believer that a guide book is a valuable investment when travelling somewhere new (even if you read it before you go). Don’t forget, these people – Lonely Planet are a particular favourite – are paid to find the best places for you to see. And these are the best from a tourist and local perspective – they’re not just trying to trick you in to conforming and 9 times out of 10 you'll end up finding somewhere brilliant you wouldn’t have otherwise have seen. Of course, there is also Trip Advisor but that’s another article! 10. Make a list of all the things you might potentially need to book in advance. There is nothing worse than arriving in a new place ready to start the trip of a lifetime only to find out that half of the main attractions you needed to book a month in advance. I have previously found Rome and San Francisco (especially Alcatraz Island) to be particularly bad for this so my advice is, once you’ve decided you definitely want to visit a place or attraction, get online and book it as soon as you can.